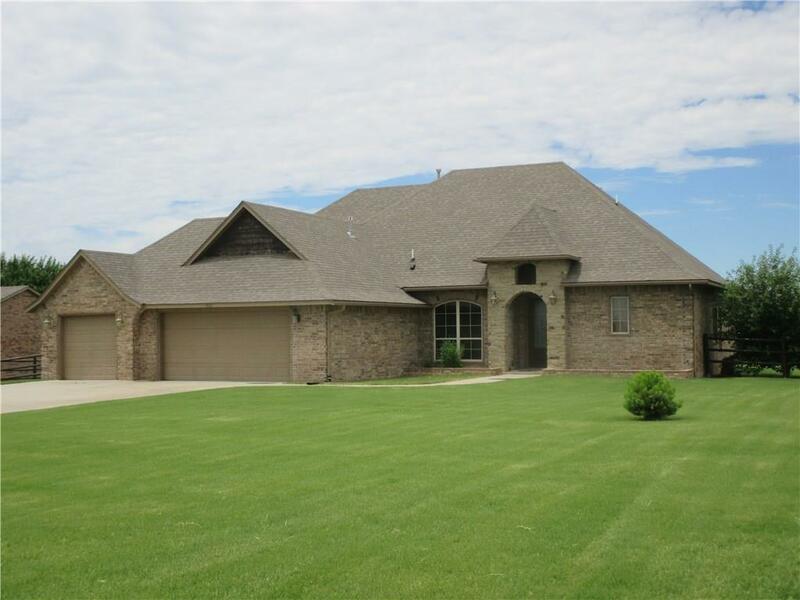 4531 Apple Estates Road, Moore, OK.| MLS# 845622 | Oklahoma City Real Estate | Apple Realty, Inc.
Beautiful Home with 4 Bedrooms + Office on 1/2 Acre within Walking Distance of Neighborhood Park, Pavillion & Splash Pad! Near Broadmoore Elementary School & Broadmoore Golf Course. Wonderful Open Floorplan w/Huge Kitchen Island/Breakfast Bar centered between the Kitchen & Living Area. Amazing Kitchen: Granite Countertops, Walk-in Pantry, SS Appliances, Commercial-styled 5-Burner Gas Stove, Extensive Cabinetry. Huge Living Area: Massive Bookshelves surrounding Beautiful Fireplace w/Gas Logs, Soaring Windows across Kitchen/Living Area for Backyard View. Enormous Master Suite: French Doors to Backyard, Pullman Ceiling, Granite Double Sink Vanity, Gorgeous Tiled Walk-in Shower, Jetted Tub, Walk-in Closet w/Built-ins. Bedrooms #2 & #3 downstairs are separated by a Full Bath. Study/Office has French Doors. 4th Bedroom/2nd Living is Upstairs w/Full Bathroom. Sprinkler System, Storm Shelter, City Utilities. Workshop <600sf allowed w/City & HOA Approval. New Roof in September 2018!